Welcome to New Zealand. Drive down the scenic road to Rotorua. Night halt in Rotorua. Visit the Rainbow Springs Kiwi Wildlife Park where hundreds of brown and rainbow trout can be seen. Next, travel onto the Agrodome for a one-hour performance seeing nineteen sheep breeds introduced onto the stage, the art of sheep shearing, sheepdog demonstrations. Later visit Te Puia Geothermal Reserve to view the boiling mudpools and cascading Pohutu geyser and see local Maori carvers in action.Night halt in Rotorua..
Travel North through the fertile Waikato region to the cave area of Waitomo. Approx travel time 3 hours. Enjoy a guided tour of the Waitomo Glowworm Caves. 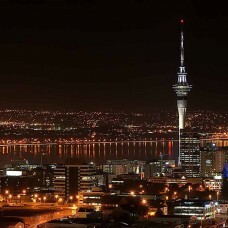 Arrive in Auckland and visit the Skycity Auckland Sky tower. 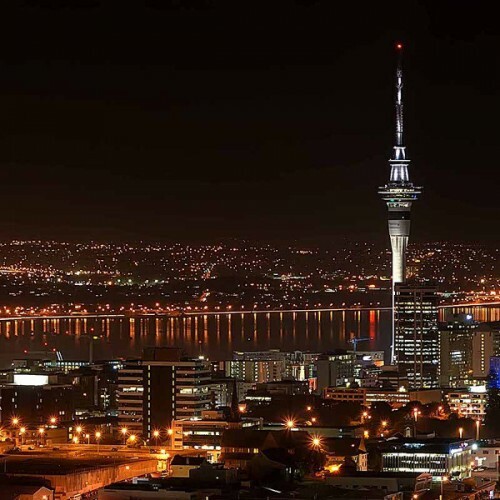 At 328 metres the Sky Tower visit offers views in every direction. Night halt in Auckland. Check out and transfer to the Airport. Arrive in Queenstown. City includes Return Skyline Gondola Ride with Buffet Lunch and Luge Ride. Take the cable car to the summit of Bob’s Peak. The best views in the region are found here, spread out in a spectacular 220 degree panorama. The Skyline Luge is fun filled gravity ride for all ages and abilities! Choose from two tracks, one scenic and gentle, the other advanced and adventurous. One of the most beautiful places on earth. A full length cruise of Milford Sound in modern, purpose built vessels offers magnificent views of the Mitre Peak and Bowen Falls. Lunch included on this cruise. (approx travel time 4-5 hours one way) Night halt in Queenstown. Depart Queenstown and travel through the rugged and beautiful landscape of the Central Otago Region. Leave Lake Wakatipu behind, following the winding road and unique surrounds of the Kawarau Gorge to Cromwell. Cross the Lindis Pass into the Mackenzie Country, with its small townships of Omarama and Twizel. Indian Buffet Lunch Menu at MacKenzie Country Hotel. Maybe include a visit to the Church of the Good Shepherd at Tekapo. Drive over golden tussock land, winding rivers and the impressive Canterbury Plains before arriving in the Garden City of Christchurch.Approx travel time 6hrs. Night halt in Christchurch. Check out of the hotel and proceed to the airport to board flight to Australia. Arrive in Sydney. Take a stroll around the city and enjoy your evening at leisure. Night halt in Sydney. Free time for shopping in Darling Harbor or Paddy's Market. Proceed to Sydney airport to board flight to Cairns. Arrive in Cairns. Evening at leisure. The grat Barrier reef is the only live structure which can be seen from the moon. Its bigger than the great wall of China. Full day Big Cat PAK4 Green Island Cruise to view the Reef including International buffet Lunch. Bring a spare dress along to change after a round of snorkelling. Night halt at Carins. ‘Movie World’, also called ‘Hollywood on the Gold Coast’. It is a fabulous extension of a fully operational movie studio. enjoy Looney tunes musical show, Police Academy - Stunt show, Batman adventure, 4D show, Superman ride, Bat wing ride etc. All Star Parade, meet your favorite cartoon characters like Bugs Bunny, Tweety and Daffy. Take Fun rides like Lethal weapon, Scooby Doo and Spooky Coaster. Pizza and Pasta buffet lunch. Night halt in Gold Coast. Proceed toward Brisbane to board the flight for Melbourne. Arrive in Melbourne and start the city Orientation tour with a trip to the largest cricket ground in the world, the Melbourne Cricket Ground or the MCG for a 1 hour tour including entrance to the National Sports Museum. Visit the Eureka Skydeck with Edge Experience for a panoramic view of the city. Night halt in Melbourne. Today we drive through one of the world’s most beautiful and naturally maintained destinations – Great ocean road. Packed lunch will be provided. Get a unique opportunity to see the 12 Apostles and Shipwreck Coast. Night halt in Melbourne. Proceed towards airport to take your return flight. Tour ends with thrilling memories of the trip. Service Tax 3.50% over and above tour cost.